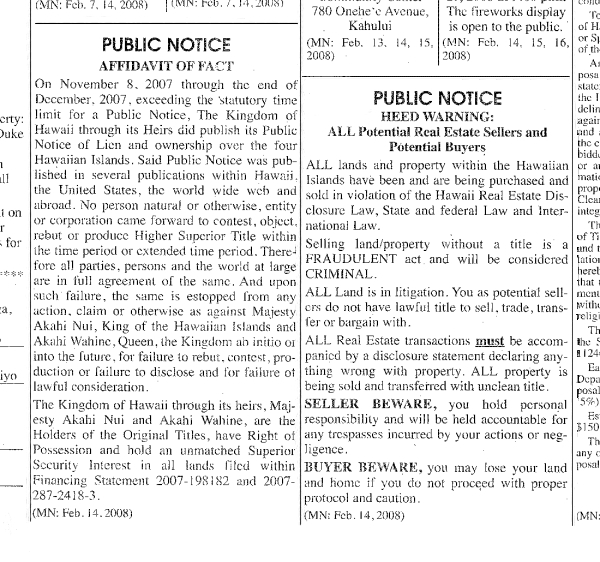 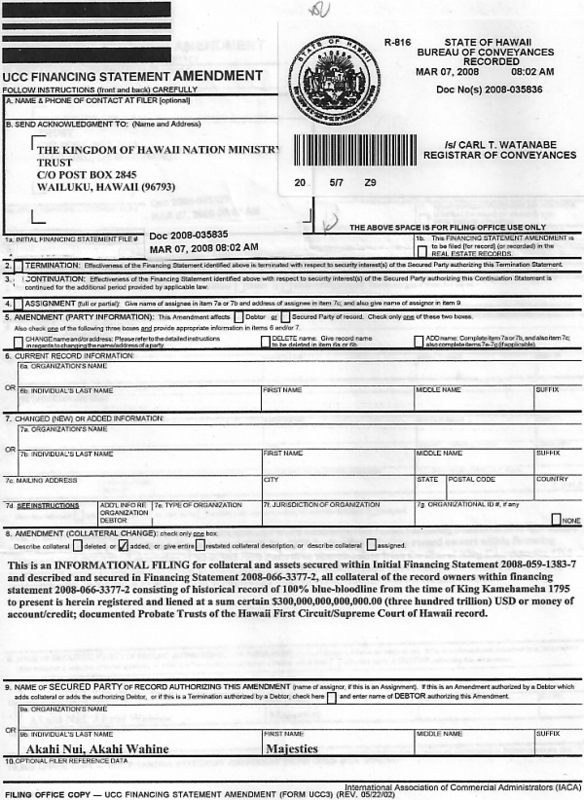 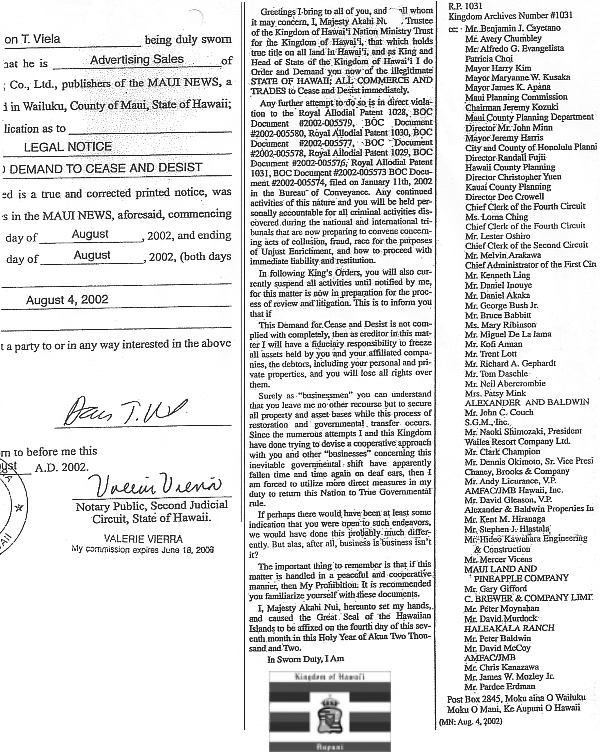 The following property is accepted for value, exempt from Levy, and herewith registered in the Commercial Chamber in favor of The Sovereign Kingdom of Hawaii Nation. 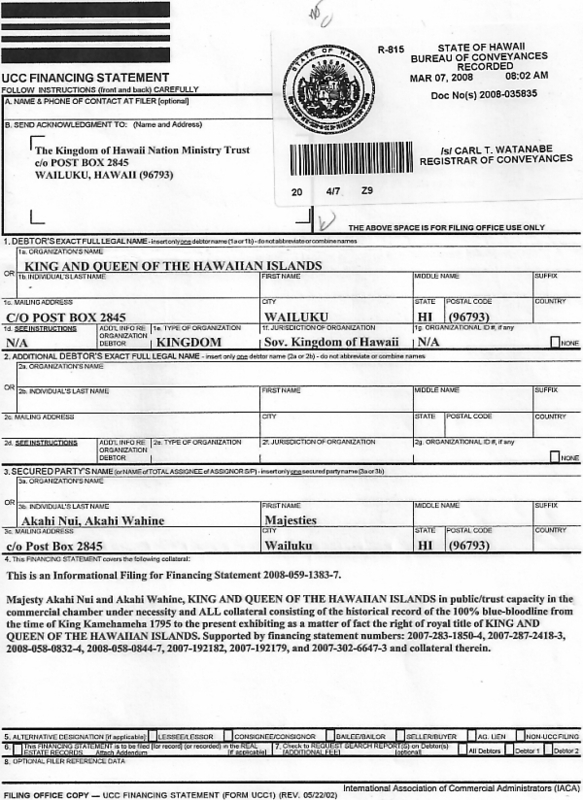 His Royal Hawaiian Majesty King Akahi Nui and Her Royal Highness Akahi Wahine, Prime Minister of The Kingdom of Hawaii in their Official Capacity as King and Queen over the Hawaiian Islands upon Allodial, True and Lawful Title/Right through Royal lineage historical record of the bloodline from the time of KING KAMEHAMEHA 1795 to present exhibiting as a matter of fact the right of royal title, including but not limited to; the reigning authority, ALL royal regalia, royal prerogative, privileges, rights and any and all royal characteristics pertaining to sovereign authority or belonging to and in virtue of said Office, said property is herein liened at a sum certain at $500,000,000.00 (five hundred million) and is the private property of the Secured Party as secured party holds all interest. 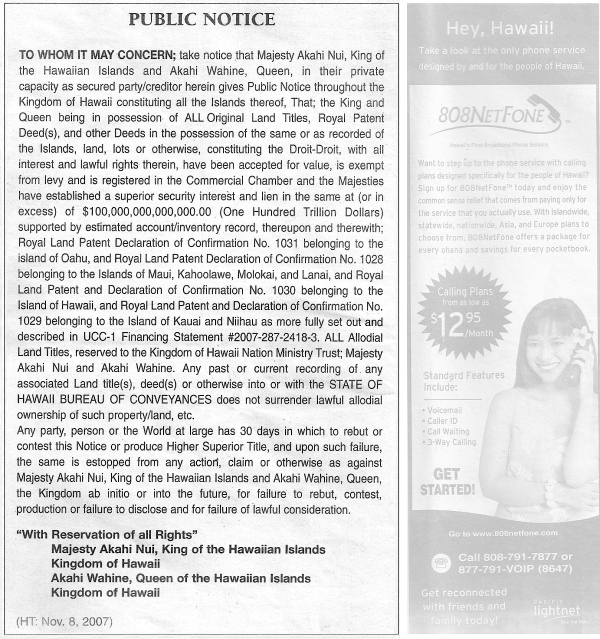 The property is described as; IOLANI PALACE containing an area of 10.982 acres, more or less, together with all improvements and all property is found within the Royal Titles and has been secured within financing statement numbers 2007-2872418-3 and 2007-192182 and Royal Land Patent Declaration of Confirmation No. 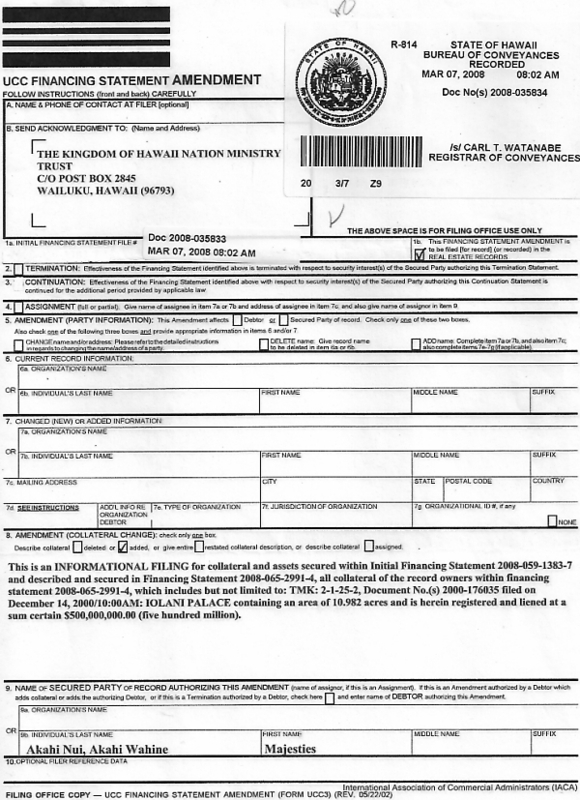 1031 containing; T.M.K. 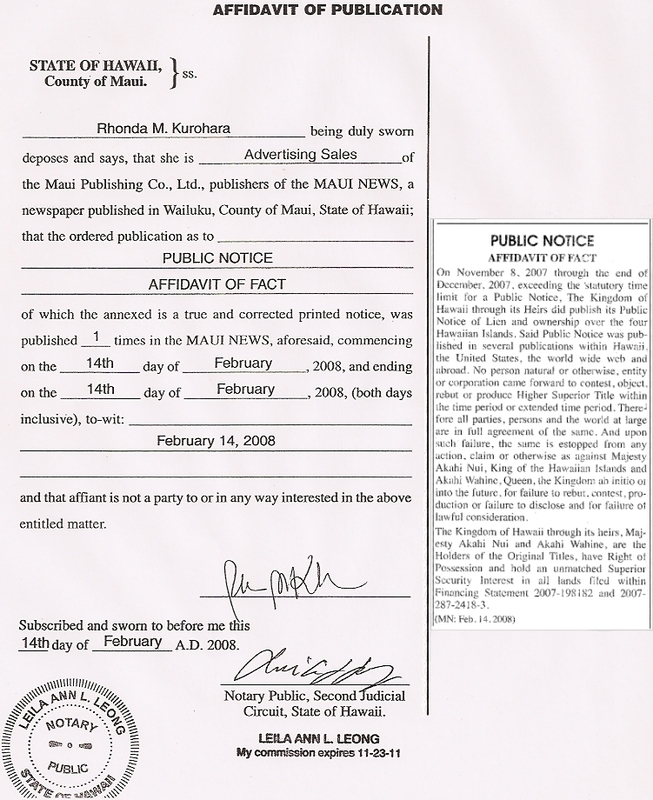 II through 9 ALL-ALL-ALL Royal Scion Names of Allodial Crown Government and Fort Lands, Na Ahupuaa, Na I i, Kingdom Government and Fort Lands and Allodial Districts on the Island of Oahu, Deed and Documents recorded at STATE OF HAWAII BUREAU OF CONVEYANCES done January 11, 2002 @ 11:30AM Document No(s) 2002-005573 thru 2002-005574; Before the above property can be seized, sold, forfeited, transferred, surrendered, conveyed, disposed of or otherwise removed from secured party's possession, Lien must be satisfied in full via Bill of Exchange in USD or money of account (credit). 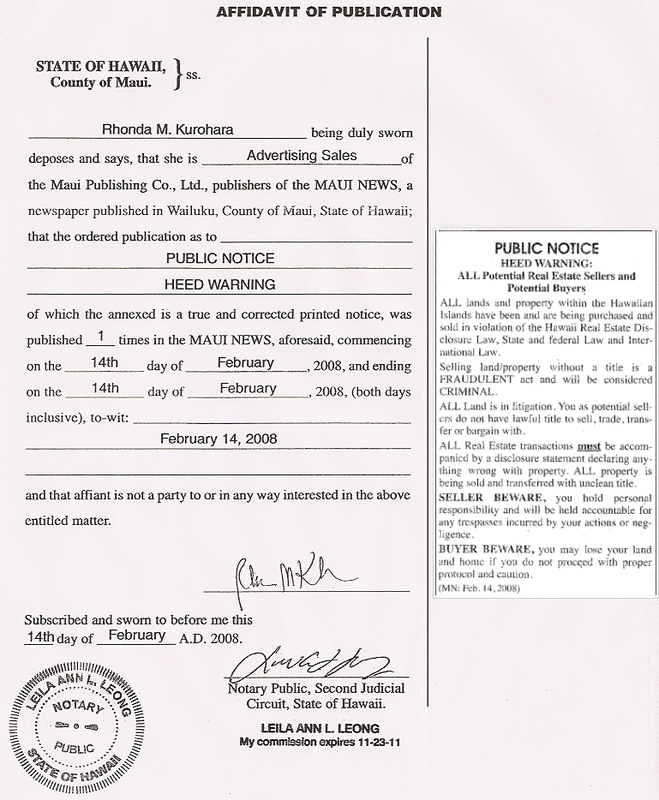 This is a common law lien and is valid for 99 years. 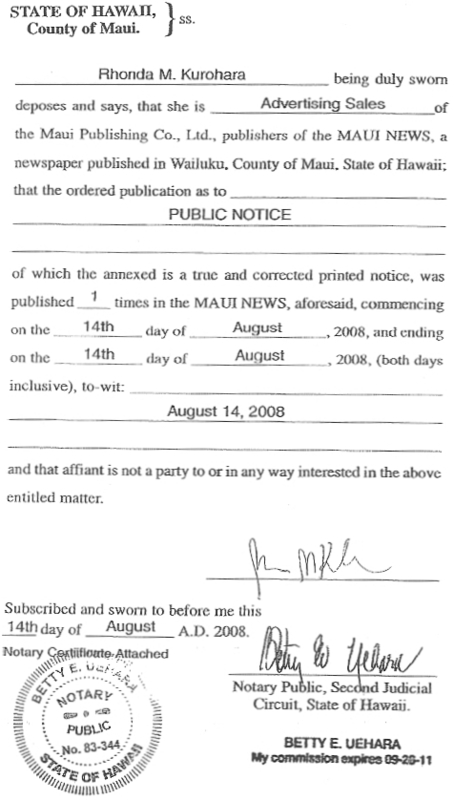 The Kingdom of Hawaii through it's lineal decent Sovereign Heir, His Royal Majesty Akahi Nui and its Prime Minister. 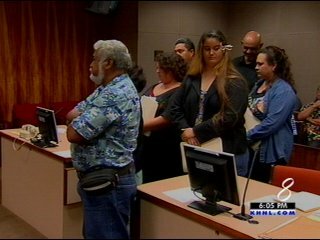 Her Royal Highness Akahi Wahine is declared to be now and forever Holder of the Original Allodial Titles having Right of Possession and holds 'thee' Superior Security Interest is ALL the Hawaiian Island lands and soil.